There's still time for Easter but planning well ahead in advance will make easter marketing a smooth ride. If you are thinking Easter is only for local chocolatiers, ice cream shops and restaurants, then think again! Easter can be used as a great opportunity to connect with prospects and clients for any kind of business. For example a dentist can organize Easter special cleaning event, a realtor can send out a happy Easter greeting card, a financial advisor can host a Easter special seminar. The list goes on. But planning all this and doing all the things right takes time and effort. And that's why we have created Easter Readymade Marketing Program. By enrolling into this program you get full coverage and full support for all your Easter marketing, at a low monthly price. You can run your Easter Marketing for 1 month or 2 month or even 3! It is recommended to run Easter marketing for 1 or 2 months. If you need high quality custom designed Easter postcards, we got you covered! Use them to invite your prospects and customers to a seminar, or just say happy Easter to your friends. We create a custom Easter postcard with your design guidelines, logo and a personal message. We use your mailing list, clean it for accuracy and use USPS first class mail to post the cards so that they reach on time. You can even include deals and coupons in the postcard, or even unique website links or phone numbers to track conversions! We do it all without charging you any extra money! If you prefer to send an Easter marketing email, this program is for you! We will design a custom email template with all the necessary details and schedule it so that it reaches your customers' inboxes at the right time. If you are already using an emailing software like Mailchimp or Constant Contact and would like us to use your account, we'll do that. Or we'll create a new account on your behalf at no extra cost to you! The account and data, all the design and copyright will be yours to keep! If you are looking to up your game a bit this Easter and want to run online Ads, we have state of the art online Ads team ready for you! Tieing Ads with holiday events like Easter is a great way to keep Ad costs low because people are naturally in the mood to spend. We will run high quality Easter Ads on Google, Bing and Facebook designed to bring you more customers. We get it, everyone is super hyper about Social Media these days. Drum rolls please, we got you covered there also! 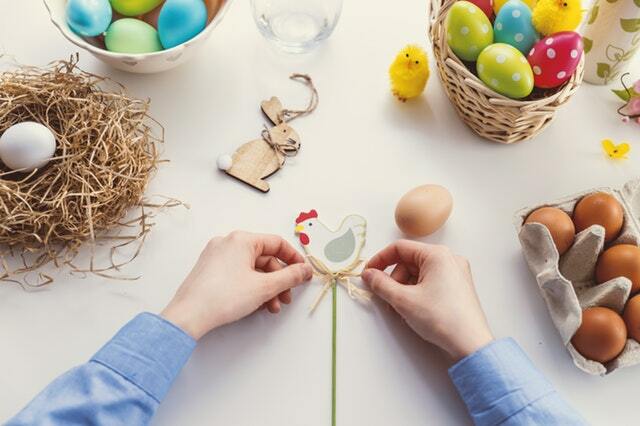 Our team of content writers, designers and social media experts work together to fill your calendar with high quality scheduled posts on Easter theme.